Project Android One by Google is one stop solution for those users who want to experience the efficiency of Android at a budgeted price. It has been dubbed as the purest form of Android experience. Codenamed Tissot, this device is the brainchild of the collab between Xiaomi and Google.Now, a lot of devices of are seeding the latest October security patches for their respective devices. Even though being a newer device Mi A1 is also getting its share of latest monthly security maintenance. 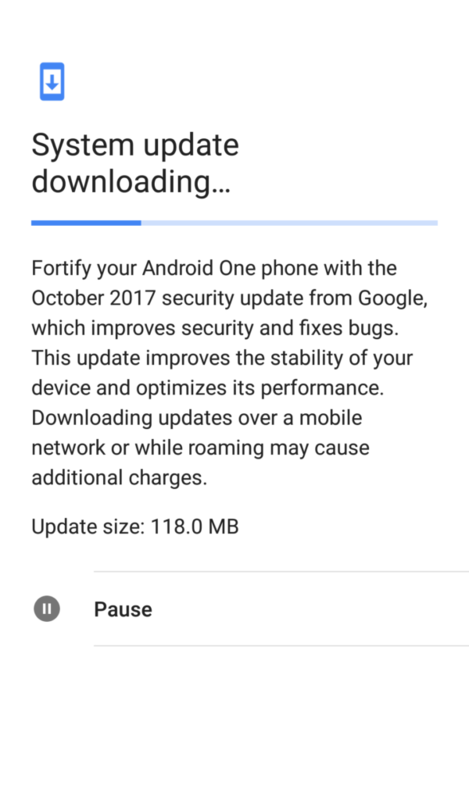 Get your devices in your hands, for the October 2017 security patch for Mi A1 is now rolling. This update is the monthly security upgrade that brings enhancements and optimizations for the device. The update weighs in at 118 MB. This update also reportedly solves the 4G network stability issue. That has been what seems a prime issue in the Indian region regarding networks. It proves Mi A1 Android One is efficient and looking forward to solving all issues to provide its users with seamless smartphone experience. The monthly security upgrade packs together the following changes and upgrades to the device. Check for available software updates. If available download the update. Comply with the on-screen instructions and install the update. Following you will find the OTA update captured for the Android One device named Mi A1. The OTA update zip weighs around 1.03 GB in size. It can be installed using ADB sideload method. The factory images will be updated soon. So stay tuned. Getting this update on your device is a wiser move. Since there have been recent issues of security threats like Blueborne it’s good to keep your device safe from everything harmful. So, grab the update and let us know what all changes you are experiencing after the update.